There’s much that’s been said and written about the rust belt and blue-collar America in the aftermath of the 2016 election. As a cultural group which—very broadly speaking—values hard work and holds dear the notion of the American dream, middle America finds itself paradoxically idealistic and pessimistic, trapped in economic downturn and communal decay, seemingly aware of it’s own situation and yet belligerently opposed to change. In Hillbilly Elegy, the bestselling memoir of growing up in rural Ohio, J.D. Vance writes “We’re more socially isolated than ever, and we pass that isolation down to our children.” Vance’s culture was one which “reacted to bad circumstances in the worst way possible” and “encourage[d] social decay instead of counteracting it.” Fathers are not fathers, mothers are not mothers, and families do not take care of each other. This moment of abandonment is where the story of “Highway Patrolman” ends, but Springsteen’s artistry has developed a legacy of its own. Devin Kelly takes Springsteen’s lyrics and marshals them anew for a collection—utterly his own—of poetry that re-treads this sense of loneliness and loss, while also grounding hope in the power of families to love one another, however badly. 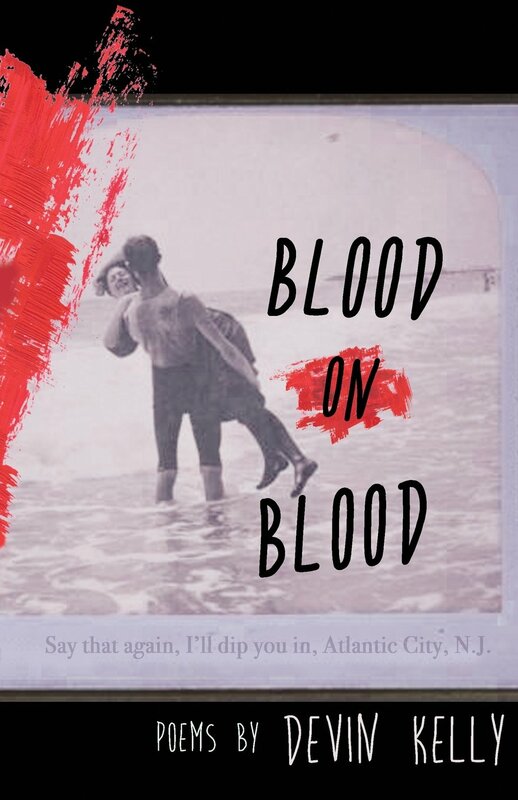 In Blood On Blood, Devin Kelly channels the rust belt angst and Americana of Bruce Springsteen’s Nebraska to craft an elegiac collection of poetry that capitalizes on and re-embodies the themes of Springsteen’s album for our present time. narrative of what made you who you are. At other times, Kelly builds around Springsteen’s narrative with poems that capture the color and tone of Nebraska, specifically its expansive sense of loneliness and longing. “My Fathers House” begins the bleak admission that “I have no stories to tell. Once, I stared / at the / word love until it became / leave.” The speaker then proceeds—of course—to tell a story, describing how his father “most days came home late, hands /greasing a bag of food,” how his father “wears gloves to keep the sun / from killing him,” how they “joke about death / often,” and his father was “his first lover.” Sadly, “in all of this / piecing together / of my father’s house, / […] I am only left / with fragments.” Like Kelly’s halting line breaks, the structure of memory offers nothing solid, and the speaker’s memory leaves him only with a gaping absence. Love has become leave indeed. These family ties, brothers to brothers and fathers to sons, obviously bear particular weight with Kelly himself. In “While Waiting to See Bruce,” Kelly presents a rare biographical poem, describing a long wait in traffic behind an exploded tanker en route to a Springsteen conference with friends. During this pause between the tail-lights, Kelly considers his own brother Bruce, described only as “a runner” and “some sort of angel / gifted beyond belief.” Kelly wonders whether or not he will ever tell his brother he felt this way, “years from now, / over beers, at a bar where we might meet, / […] or while our / grandchildren linger in a room beside the one / where we sit.” Bruce the runner is always moving, never stopping, quick as memory, always capable of catching Kelly when he least expects it. wishing would get you anywhere. I’m wishing now Joey. It’s so dark here. In the aftermath of this poem, I thought of my own brother and my own father, of memories shared and disagreed upon, of promises both kept and broken, of love that has abided in both presence and absence. Springsteen and Kelly know these relationships to be infinitely complex and, for many of us, infinitely unresolved. In sharing this truth, Kelly can offer something to shore up the decay and broach the isolation described by J.D. Vance and others who see the fear accompanies our shattered family systems. If we are to talk of the American dream again (if there ever was a dream), we must first talk of our fathers. If we are act on it, we must make peace with our brothers. J.D. Vance, Hillbilly Elegy: A Memoir of a Family and Culture in Crisis (New York: HarperCollins, 2016), 4.